Why keep work-related mementos and how can digital technology help to organise them? 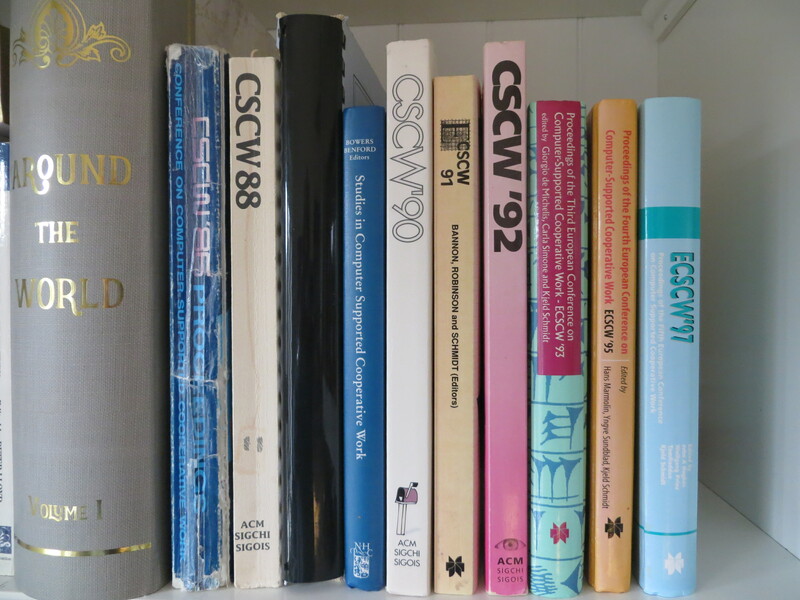 The sort-out of my publications, reports and CSCW proceedings (broadly categorised as ‘things I had created and done’) confirmed that I have a particular interest in material I had created or had made significant contributions towards. It was undoubtedly rewarding to revisit the material – though I wouldn’t anticipate doing it again very often. In fact, it made me realise that just having the knowledge that all the material is available and easily accessible, is itself a very satisfying and reassuring thought. Of course, having a complete collection of work documents to draw on when assembling full sets of my publications and reports, was slightly unusual; most people might only have partial sets depending on what particular material they had saved in the course of their careers. Formal job documents (offer letters, job specs, pension info, pay slips etc. ): I originally kept these for reference; but now, of course they have become very informative pieces of memorabilia. Company information (brochures, newsletters etc. ): Many of these are well presented documents providing detailed information about the organisations I worked for. Recognition objects (certificates, long term service awards, contract win artefacts etc. ): I didn’t keep the originals of certificates confirming I had completed in-company courses as they didn’t seem very significant; however I do value a certificate from my professional body and keep it framed on my study wall. I’ve kept the cut glass paperweight celebrating a contract win, and the cut glass bowl for long service, which are both in our crystal cabinet; though they are retained more because of their looks than as reminders of work. I also value the long service domino set (very nice in a large wooden box) which I chose deliberately because I knew I would want to keep it long term for both its utility and its looks. People I worked with (humorous documents, social gatherings, leaving cards, etc. ): These are generally mementos of the people I worked with and the activities we did together. Associated activities (company sports and social clubs, trade unions, professional bodies etc.) These are mementos of my activities in organisations associated with my work, and they are surprisingly prominent in my collection. I guess they such organisations have played a significant part in my working life over the years. In thinking back about what I’ve done with all these different sets of work items, I was reminded of how sometimes particular items have corrected a fact that I had mis-remembered. For example, for several years, I believed that I was the instigator of the Alvey project I was involved in (Cosmos). However, in trawling through my documents to create one of the Electronic Story Boards, I discovered that it was a colleague who had been the instigator and I was a very ardent subsequent advocate. I guess that often we remember things in the way we would like them to be, not necessarily the way they actually were. Hence, having some documentation or other artefact can cast a truer light on the past. However, it must be remembered that the documents we have may only be a subset of all the relevant documents that were produced; and/or that their contents may just be reflecting the biases of the authors. Hence, whatever the nature of our ‘record’, be it memory, or a selection of the relevant items that you have, or all of the items that you have, or, indeed, all the relevant items that exist in the world, we should always remember that it may not be the whole story. As with my non-work mementos, most of these work items have been digitised and the originals disposed off; though a small number, which I decided are special in some way or other, have been retained in physical form. In this respect, these work items are very similar to other types of memento. However, there is one very significant difference: many of these work items will not be recognisable by my wife and family. That’s because my work took me to a different place and a different life for a part of each day – as it does for very many people; hence, work mementos are likely to mean more to the individual than to family, relatives and friends. Consequently, I suspect that such collections are even less likely than other types of mementos to be retained and maintained by future generations of the family. I believe this to be almost certainly true for physical work mementos (I can’t see people hanging onto bulky books and papers which mean little to them). However, I’m less sure about digital collections which, in principle, are much less obtrusive and much easier to keep in the short term, but do rely on some care and attention as computers are replaced and technology advances. In fact, this uncertainty must apply to all informally-held digital collections – too little time has passed so far to be able to discern if such material is being passed down the generations. Interestingly, I do see the possibility of Artificial Intelligence playing a role in managing such material, and this could significantly affect how much of its digital history a family may have access to in the future. Categories of work mementos include; things the individual has created and done, work books, formal job documents, company information, recognition objects, people the individual has worked with, and associated activities. While work mementos are similar to other type of mementos, they do provide reminders of a part of life that is often very personal to the individual and often separate from family life. In as much as work is often done with other people, it is almost like a parallel life with a separate family; hence, it generates a separate set of mementos. Work concerns making, creating and doing things; and if individuals are in any way proud of what they have done, then they may well be keen to retain examples of what they achieved and to inspect it from time to time. It is very satisfying and reassuring to know that examples of what you have produced at work, are safely stored away and accessible when you want them. Just being able to have those thoughts may be as rewarding as actually looking at the material. Our ‘record’ of events is only as good as the material we have, be it memory or a few relevant artefacts, or lots of artefacts. We should always remain open to the possibility we don’t have all the facts. Work mementos are probably less likely to be passed on down family lines than other types of mementos. Physical work mementos are less likely to be passed on down family lines than digital work mementos. Artificial intelligence may result in many more digital mementos of all types being passed on reliably down the generations. Part of a shelf in my bookcase is taken up with hardcopies of a few reports and documents that I wrote or had a hand in writing. I’ve kept these because the hardcopies were available and I feel they are substantial pieces of work (they fall into the category of ‘Items that the owner has written, produced, assembled or made a significant contribution to’ as documented in the paper produced in the Digital Age Artefacts journey). 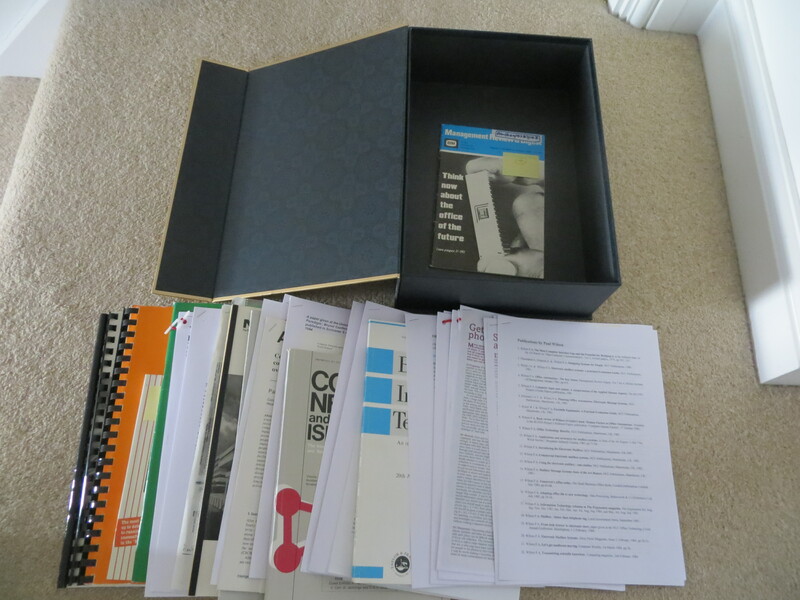 However, these are just items that I came across in the course of doing digital preservation work on my work file collection; I have produced many other reports and documents over my working career, some of which I feel are just as substantial. In thinking through what I want to do with this material, I’ve concluded that I don’t really want the hardcopy except in particularly special cases. However, I would like to have electronic versions of all the major reports I’ve produced in order to be able to look through them from time to time, to see how my ideas developed, and to enjoy the satisfaction of achievement. So, my plan is to use my CV to guide me through the various companies I’ve worked for and assignments I’ve undertaken, and to search my work files for reports I may have produced in each one. I’ll take an electronic copy of some of those that I find and give each one a serial number in the file title. The files will be recorded in an index in chronological order, and stored on my iPad. At the end of the process, any hardcopies that I’ve decided to keep will be placed into a box file on the bookshelf. 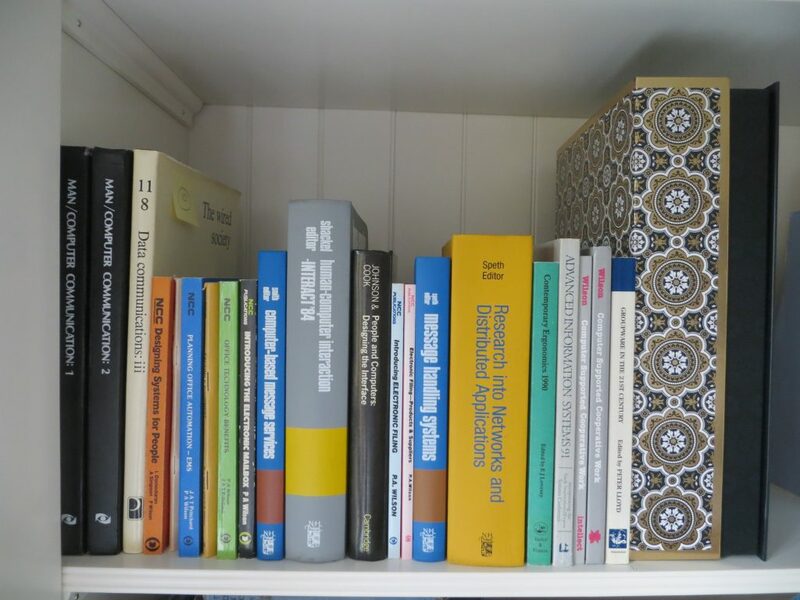 Since retiring in 2012, I’ve been gradually sorting out my work documents and books (see the Personal Document Management, Electronic Bookshelf and Electronic Story Board journeys), and in the process have been finding things I’ve had published and putting them in a holding location on a shelf. I’m not an academic, so I have never had a career incentive to publish papers; I just got into the way of doing it when I had a job at the National Computing Centre in the early 80s which entailed seeking out best practice in Office Automation and feeding it back into UK industry via books, articles and talks. 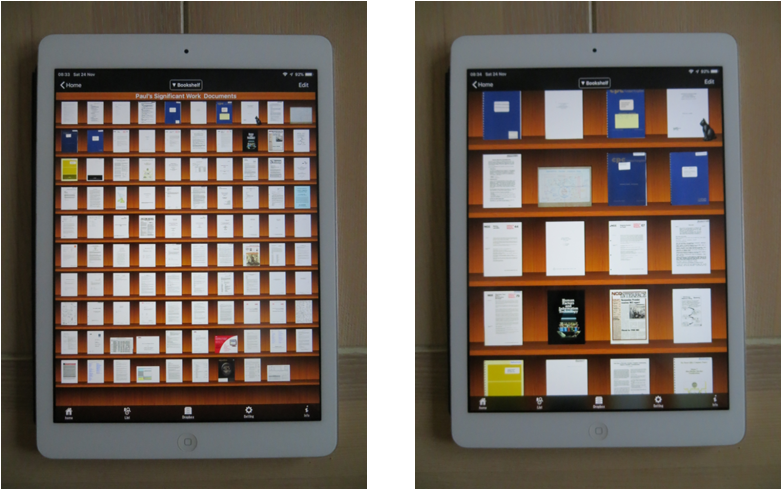 So, now, with at least 30 or 40 papers and books to my name, I’d decided to try to make sure I had a copy of each one. My plan was to keep all the originals for my own sense of satisfaction (as already documented in the paper produced in the Digital Age Artefacts journey – they fall into the category of ‘Items that the owner has written, produced, assembled or made a significant contribution to’). This physical set of material would have an equivalent electronic version which would reside on my iPad for easy access and to enable me to possess copies if, at some time in the future, a lack of space or changed circumstances prevents me from having the physical versions on hand. The collection would be controlled by adding serial numbers (1, 2, 3 etc) to the publication list that I’d been maintaining since the 1990s, and using that as an index. This would enable each physical item to be labelled, and each electronic file to have the serial number included in its file title thereby ensuring that the iPad items would be displayed in chronological order. Over the days that I was developing this approach, I also spent some time thinking about whether this material would be of any interest to my family after my decease. I concluded that probably only the books I had published would stand a chance of being retained. Large published tomes of conference proceedings which include 9 or 10 pages of a paper I had presented would almost certainly end up in a charity shop or auction lot. As to whether the family would want to retain the electronic collection downstream, it’s difficult to say. They would certainly find the electronic version easier to curate; but whether there would be the interest to do so is an unknown. for some of the entries in the index, there wasn’t an equivalent hardcopy on the shelf and I had to search out a version from my work files. for some items, the original publication wasn’t immediately to hand so a search had to be conducted through the work files and, If it wasn’t found, a decision had to be made as to which version of the piece was to be used. for several items the original was in a book, requiring a scan to be made of those pages by placing the open book on the scanner platter and pressing down to obtain a usable scan of each page. These scans had to be refined within a PDF editor to crop out black areas round the edges and to assemble the pages in the correct order within the final PDF. For two of the books I’d written, a spare copy was not available to cut up and put through the sheet feeder; so I had to deal with the whole of the two books in this way. a so-called White Paper describing what I meant by ‘Order From Chaos’ and published in an early version of this OFC website. I suppose the overriding criteria was that the piece should contain novel material with general applicability, was produced as a complete and coherent whole, and was made openly available – whatever all those words mean! In fact, I guess I just included the pieces I wanted to…. Having been through all the material, I ended up with some 61 items in the index, 61 separate PDF files, 19 physical books, and a box file containing the other 42 papers in journals, spiral bound publications, and print outs – as shown in the photos below. The box file was essential to store those items which would otherwise just flop about on the bookshelf. Work in this context refers to one’s employment – the activities that people do to earn a living and sustain themselves. It seems to me that, for many people, work is fundamentally an individual activity; they have their own capabilities and skills, and they are employed as individuals – even though they may well perform their work as part of a group. Hence, when it comes to valuing and keeping work-related materials, attitudes and approaches may well be slightly different to mementos and other things which are acquired in life outside work and which are more likely to be known about, understood and valued by an individual’s family and close friends. These are just broad assumptions and generalisations, however they are based on my observations in some of the journeys recorded in this blog – for example, memento management, organising family photos, electronic bookshelf and electronic story board. Specials: books or journals of particular significance to me and/or which are first editions or first volumes. I hesitated to create a new OFC topic to discuss how such items can be dealt with because I thought the material was too specific and that any conclusions would not have wide applicability. 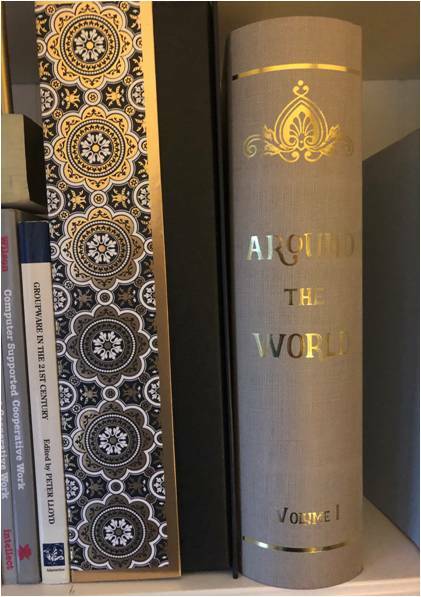 However, when I got stuck into the Publications, and remembered that I’d already been dealing with work-related items in other journeys, I thought that perhaps some more generally applicable conclusions might emerge. We’ll see.